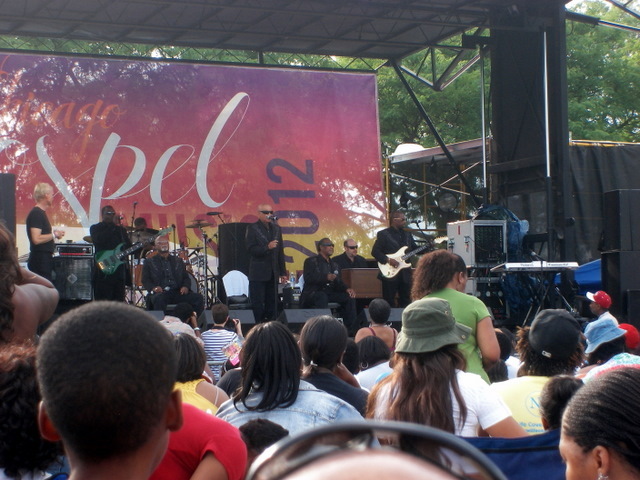 Hannah wanted to go to Moody Church on a Sunday because at that same day there was a Chicago Gospel Festival. Moody Church is kind of very big even though it is not bigger than some giant size Churches. But the size is not important. 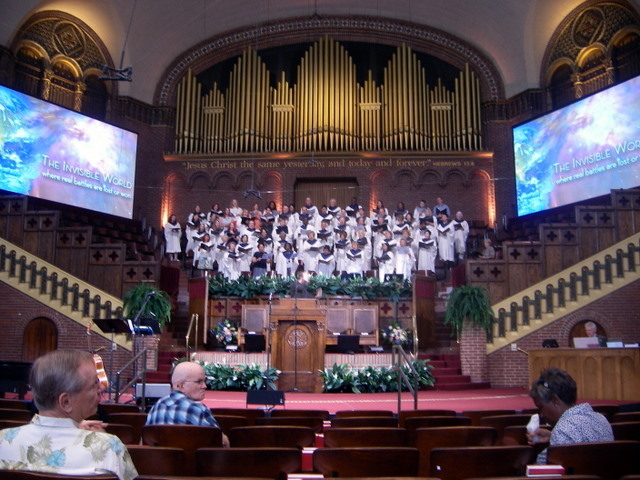 The service was good and the choir was very good too. Unlike the other Churches where they do modern style of worship, Moody has kind of traditional style of worship which I like much. After the service, I went to the Welcome Centre and they had so-called Church Tour and I took that. 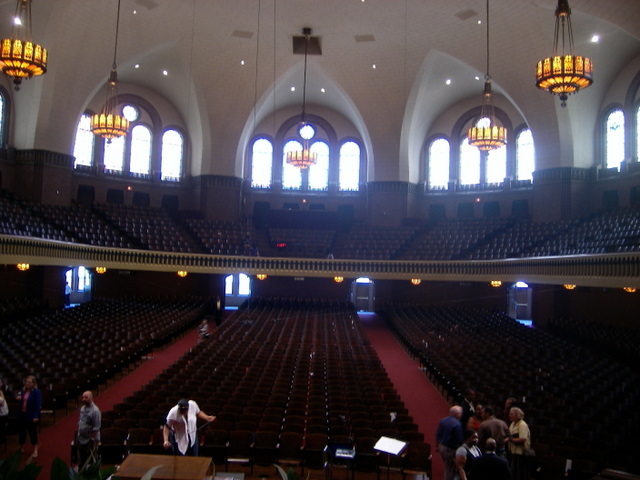 It was kind of betraying my expectation because the tour means we go every corner and see the Church, while we were just taken to the Choir seat and just heard about D. L. Moody. I did not know about him but he is kind of great guy with just two years of formal education doing such great works. At the Welcome Centre, they have a world map with red pushpins so that the visitors can pin up their home location. I found there is no space left for whole Korean peninsula, and there was no pin at Winnipeg, so I pinned up on Winnipeg! Yeah! I became the first from Winnipeg! I heard that the original name of the Church when D. L. Moody was alive was Illinois Street Church. Now I am just not sure whether it is good or not to name a Church after a mortal. I think if he knew, he must be so against it. After the service, Hannah and I went to China town and had lunch. It was good, but the parking was $9 for an hour! The good thing was that the restaurant gave us the parking validation so we just paid only $2! 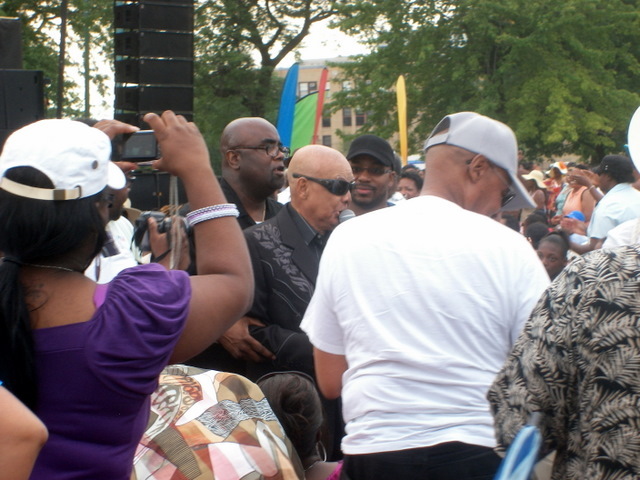 When we arrived at Chicago Gospel Festival, we were so afraid seeing that there is almost 100% black people only. We were kind of the only non-black. But as we all know, the black people’s music is so powerful. 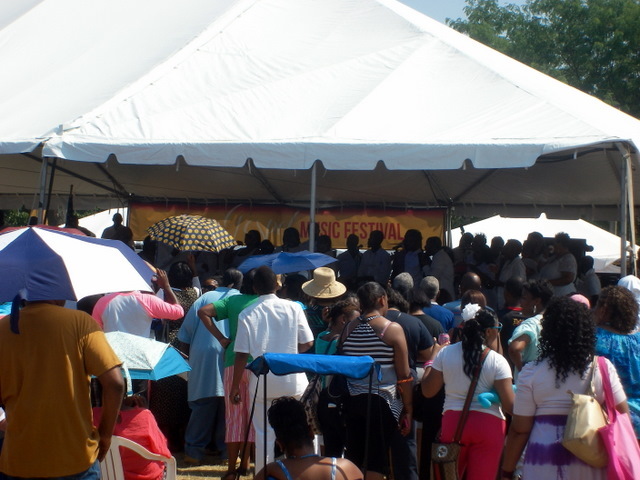 In the festival, they announced almost every ten minutes who sponsored – Chicago Tribune, McDonald and so on. I found there is BMOA which is Black McDonald Operators’ Association. It was kind of good day, with the good service and powerful music and even we got two coupons for free McDonald’s drinks. 아내가 시카고 가스펠 축제가 있는 날에는 무디 교회에서 예배를 드리길 원했는데, 무디 교회는 시카고 다운타운에 있기 때문이다. 무디는 꽤 크지만, 엄청난 규모를 자랑하는 다른 교회들보다 더 큰 건 아니다. 하지만 크기가 중요한 건 아니지. 예배는 꽤 좋았고 성가대도 아주 좋았다. 현대식 예배를 하는 여타의 교회들과는 달리 무디 교회는 전통적인 방식의 예배를 해서 참 좋았다. 예배 후에는 웰컴 선터라는 곳에 갔는데, 그 곳에서 소위 교회 투어라는 걸 해서 참석 했는데, 좀 배신감을 느꼈다. 투어라면 교회 구석 구석을 다니면서 봐야 하는데 우리를 성가대석에 데리고 가더니 거기서 그냥 D. L 무디에 대해 설명만 해줬다. 정규 교육을 2년밖에 받지 못하고 그런 일을 하다니 대단한 사람이긴 하다. 웰컴 센터에는 세계 지도가 있고 빨강 압정이 있어서 방문자들이 자기가 온 곳의 지역에 꼽을 수 있게 되어 있는데, 한국에는 더 이상 꼽을 자리가 없었는데, 위니펙에는 아무 압정도 안 꼽혀 있어서 위니펙에 압정을 내가 꼽았다! 야호! 위니펙에서 온 첫 사람이 되었다! D.L 무디가 살아 있을 때의 원래 교회 이름은 일리노이 길거리 교회였다고 들었는데, 사람의 이름을 따라 교회 이름을 짓는 것이 잘하는 짓인지는 잘 모르겠다. 아마 무디가 알았더면 완전 반대했을 거라는 생각을 한다. 예배 후에, 한나와 함께 차이나타운에 가서 점심을 먹었는데, 주차비가 9불이 나왔다! 다행히 식당에서 주차 도장을 찍어줘서 2불만 내고 말았지만. 시카고 가스펠 축제에 도착했을 때는 걱정이 되었던 게, 거의 모든 사람들이 100% 흑인들 뿐이었고 아내와 나만 거의 유일한 안-흑인이었다. 하지만 알다시피 흑인들의 음악은 굉장히 힘이 있었다. 여러 그룹들이 노래를 했는데 내가 제일 좋아했던 것은 알라바마에서 온 블라인드 보이즈였다. 할아버지들이었는데, 노래는 정말 힘차게 그리고 잘 했다. 흑인들은 목소리도 좋고 리듬 감각도 좋은 것 같다. 할아버지들은 눈이 안보이는데도 군중들 틈으로 내려오기까지 했다! 축제에서는 거의 10분에 한번씩 후원이 누구인지 광고를 했다. 시카고 트리뷴, 맥도날드 등등.. 흑인 맥도날드 경영자 연합회라는 조직이 있다는 것도 처음 알았다. 꽤 즐겁고 좋은 날이었다. 예배도 좋았고 강력한 음악도 좋았고, 맥도날드의 무료 음료수 쿠폰도 두 개나 얻었다!